24 year old Brittany Latrece Russell, of Beaumont, slid sideways into a crepe myrtle tree in Seven Oaks. 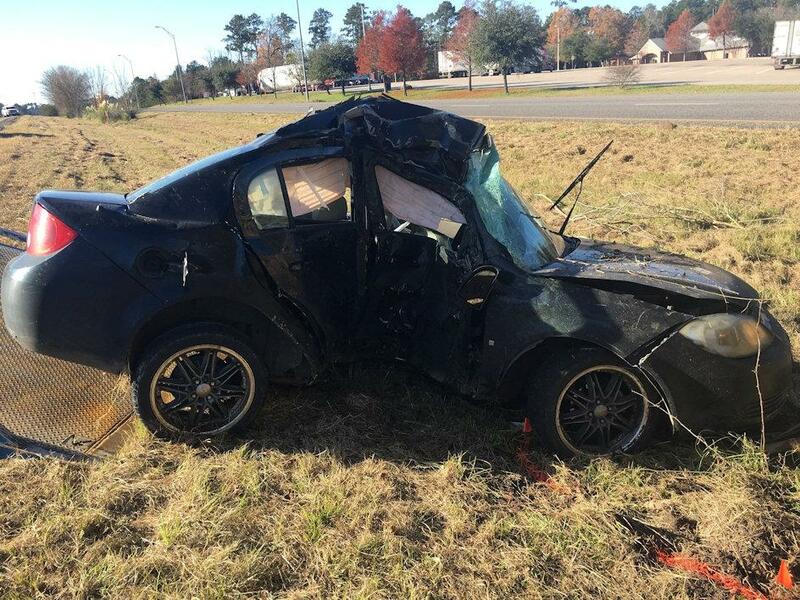 Driver in Critical Condition After Slamming Into Tree, SEVEN OAKS, December 2, 2018 - At approximately 8:35 am on December 2, 2018, a black 2010 Chevy Cobalt, driven by Brittany Latrece Russell, 24, of Beaumont, was north-bound on US-59 when for some reason, her vehicle left the pavement to the left (in the vicinity of the rest area), entered the center median, and slid sideways into a large crepe myrtle tree. Allegiance Ambulance Service was dispatched to the scene along with the Livingston Volunteer Fire Department Heavy Rescue Unit, Deputy Josh Sanders with the Polk County Sheriff's Office, and Troopers Chris Cain, Zach Lenderman, Donny Akers, and Corporal Ramey Bass with the Texas Highway Patrol. Russell was entrapped as firemen used the Jaws-of-Life to get her door open. Russell was loaded into an ambulance and driven to the Highway Rest Area where a PHi Air Medical Helicopter landed and flew her to Hermann Hospital in Houston in critical condition. One lane of traffic on the north-bound side of 59 was blocked during investigation and cleanup. It has not yet been determined why Russell left the pavement. Russell's vehicle was recovered by Riley Wrecker Service out of Corrigan. This accident remains under investigation by the Texas Highway Patrol. WARNING: The images below show scenes from a single vehicle accident. One image shows a small amount of blood. If any of this offends you in any way DO NOT scroll down this page. 24 year old Brittany Latrece Russell, of Beaumont, is unloaded from her vehicle by emergency personnel. Corporal Ramey Bass gathers information from Russell's vehicle. Russell is loaded into an air medical helicopter and flown to Hermann Hospital in Houston. 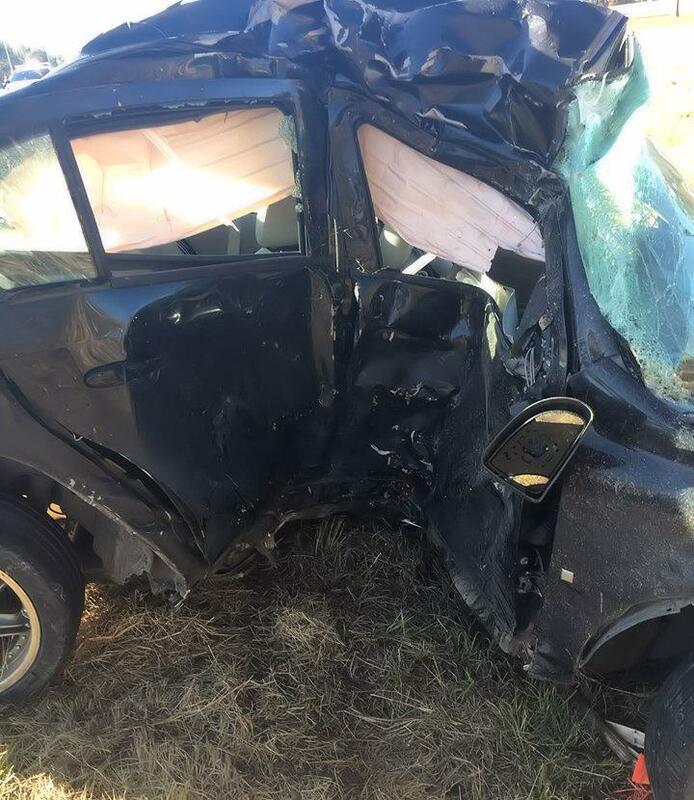 Russell slid sideways into the tree with the passenger side of the vehicle impacting the tree. PHi Air Medical lifts off from the Seven Oaks Rest Area (north-bound side) enroute to Houston.